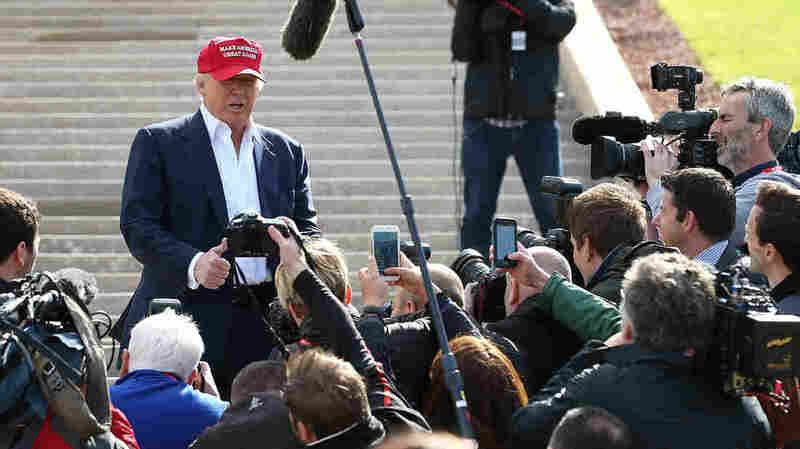 Donald Trump Bans 'Washington Post' From Campaign Events The action is the latest in a string of moves Trump's campaign has made in denying credentials to news outlets that, in the mind of the billionaire businessman, have not treated him fairly. Presumptive Republican nominee Donald Trump has a love/hate relationship with the press, drawing high levels of publicity while limiting access to media organizations. Presumptive Republican presidential nominee Donald Trump announced Monday he was revoking press credentials for The Washington Post, upset with the major newspaper's coverage of his campaign. The action from the Trump campaign is the latest in a string of moves Trump's campaign has made to ban reporters and news outlets that, in the mind of the billionaire businessman, have not treated him fairly. According to another Facebook post, the final straw seems to have been a story that the Post originally headlined "Donald Trump suggests President Obama was involved with Orlando shooting." The current headline now reads, "Donald Trump seems to connect President Obama to Orlando shooting." "We changed the headline shortly after it posted to more properly reflect what Trump said. We did so on our own; the Trump campaign never contacted us about it," Post Vice President for Communications Kristine Coratti Kelly told NPR. In the story, the Post quoted a Fox News interview from Monday morning in which Trump said that Obama "either is not tough, not smart, or he's got something else in mind" in his refusal to mention the words "radical Islamic terrorism" following the mass shooting at an Orlando gay nightclub that killed 49 people early Sunday morning. This headline, however, is not the first Post item that has gotten under Trump's skin. Reporter David Farenthold pressed Trump for details about donations he promised to make to veterans groups after a January fundraiser. And only after that reporting did Trump donate the $1 million he had promised and already said he had donated. Trump held a press conference to reveal that he had donated the money and called Farenthold a "nasty guy." Trump has also alleged that Post owner Jeff Bezos was using the newspaper to protect Amazon, which he also owns, from higher taxes. He offered no evidence for that claim. In a statement explaining why he banned the Post, one of the most influential newspapers in the country, Trump's campaign repeated that accusation. "We no longer feel compelled to work with a publication which has put its need for 'clicks' above journalistic integrity," the Republican's campaign said in a statement. "They have no journalistic integrity and write falsely about Mr. Trump. Mr. Trump does not mind a bad story, but it has to be honest." "Donald Trump's decision to revoke The Washington Post's press credentials is nothing less than a repudiation of the role of a free and independent press. When coverage doesn't correspond to what the candidate wants it to be, then a news organization is banished. The Post will continue to cover Donald Trump as it has all along — honorably, honestly, accurately, energetically, and unflinchingly." The Post is not the first news organization denied credentials to cover Trump's campaign events. The Huffington Post, Politico, BuzzFeed, the Daily Beast, the Des Moines Register, the New Hampshire Union Leader, Univision and others have also been blocked from covering events. Trump has had a contentious relationship with the press ever since he announced his candidacy almost a year ago. But the acrimony with the Fourth Estate increased once it became clear he would be the Republican nominee. In a press conference last month about those donations to veterans groups, Trump berated reporters after he detailed the source of the donations. "I think the media is frankly, made up of people [who] in many cases — not in all cases — are not good people," Trump said, singling some reporters out by name and calling one ABC reporter a "sleaze." And he said his approach to the press would stay the same if he were elected to the White House: "Yeah, it is going to be like this. You think I'm going to change? I'm not going to change." "Donald Trump misunderstands — or, more likely, simply opposes — the role a free press plays in a democratic society," Thomas Burr, the National Press Club president, said after that contentious press conference. "Reporters are supposed to hold public figures accountable. Any American political candidate who attacks the press for doing its job is campaigning in the wrong country. In the United States, under our Constitution, a free press is a check on politicians of all parties. If we are to demand that other countries respect the tradition of a free press we must also practice that here at home."